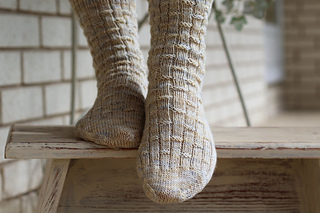 My favorite sock patterns are those that look interesting when worn, but are deceptively simple to knit. I think these fit the bill. The stitch pattern is easily memorized, with just enough going on to keep your interest, but not so complex that you have to concentrate too much. And the finished sock is rather like a classical greek column, hence the name. Socks are worked from the cuff down. Knit with a heel flap, heel turn and gusset. 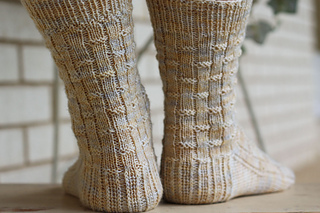 The stitch pattern is reversible, if you prefer to modify the pattern and knit them from the toe up. The stitch pattern will look the same both ways. Pattern may be knit using DPNs, two circular needles or one long circular with the magic loop method.